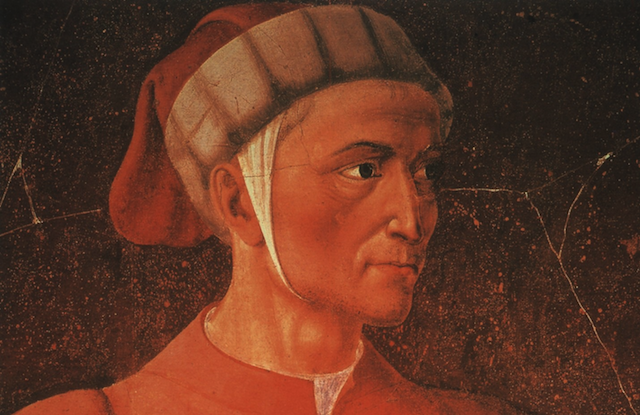 What was Dante’s personality like? Our poet […] was of middle height, and after he had reached mature years he walked with somewhat of a stoop; his gait was grave and sedate; and he was ever clothed in most seemly garments, his dress being suited to the ripeness of his years. His face was long, his nose aquiline, his eyes rather large than small, his jaws heavy, with the under lip projecting beyond the upper. His complexion was dark, and his hair and beard thick, black, and crisp; and his countenance always sad and thoughtful. Whence it happened one day in Verona (the fame of his writings having by that time been spread abroad everywhere, and especially of that part of his Commedia to which he gave the title of Hell, and he himself being known by sight to many men and women), that as he passed before a doorway where several women were sitting, one of them said to the others in a low voice, but not so low but that she was plainly heard by him and by those with him, ‘Do you see the man who goes down to Hell, and returns at his pleasure, and brings back news of those who are below?’ To which one of the others answered in all simplicity: ‘Indeed, what you say must be true; don’t you see how his beard is crisped and his colour darkened by the heat and smoke down below?’ Dante, hearing these words behind him, and perceiving that they were spoken by the women in perfect good faith, was not ill pleased that they should have such an opinion of him, and smiling a little passed on his way. In his manners, whether in public or in private, he was wonderfully composed and restrained, and in all his ways he was more courteous and civil than any one else. In food and drink he was very moderate, both in partaking of them at the regular hours, and in never indulging to excess; nor did he ever particularly care for one thing more than for another. He commended delicate dishes, but for the most part lived on plain fare; condemning in no measured terms those who study much to have choice dainties, and to have them prepared with all possible care,— declaring that such people do not in order to live, but live in order to eat. No man was more wakeful than he, whether in his studies or in anything which gave him anxious thought, to such an extent that many a time his household and his wife used to be vexed at it, until, growing accustomed to his ways, they came to take no notice of it. He rarely spoke, save when spoken to, and that with deliberation and in tones suited to the subject of his discourse. Nevertheless, when occasion demanded, he was most eloquent and fluent, with an excellent and ready delivery. In his youth he took the greatest pleasure in music and singing, and was on friendly and familiar terms with all the best singers and musicians of the time. And his love of music led him to compose many things, which he had set by them to pleasing and masterly accompaniments. How ardently he was devoted to love has already been shown; and it is firmly believed by all that it was this love which moved his genius to composition in the vulgar tongue, at first in the way of imitation; afterwards through his desire to express his emotions in more permanent shape, and for the sake of renown, he assiduously practised himself therein, and not only surpassed all his contemporaries, but also so illustrated and beautified the language that he made many then, and will make many tongues hereafter, eager to become skilled in their own tongue. He delighted also in solitude, holding himself aloof from other people, in order that his meditations might not be interrupted; and if while he was in company any thought occurred to him which pleased him well, however much he might be questioned about any other matter, he would make no reply to his questioner until he had either made sure of his idea or had rejected it—a thing which happened to him many a time when questions were put to him at table, or by his companions on a journey, or elsewhere. In his studies he was most diligent, and while he was occupied with them no news that he might chance to hear could take him away from them. 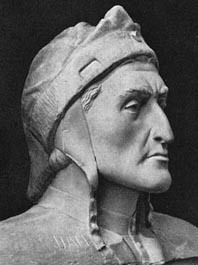 And it is related by certain credible witnesses, with regard to his giving himself up wholly to what pleased him, that on one of the occasions when he was in Siena, he chanced to be at an apothecary’s shop, where a book was brought to him which had been previously promised him, this book being one of much reputation among persons of worth, and having never yet been seen by him. As he happened to be unable to take it elsewhere, he leant over on to the bench in front of the apothecary’s shop, and there, placing the book before him, began most eagerly to examine it. Soon afterwards, in that same quarter, close to where he was, on the occasion of some general festival a great tournament took place among the noble youths of Siena, accompanied, as is usually the case on such occasions, with a great deal of noise caused by the various instruments and shouts of applause from the bystanders; yet, in spite of all this, and of many other things likely to attract the attention, such as fair ladies dancing, and youths’ sports of all kinds, he was never seen to stir from his place, nor so much as to raise his eyes from his book. Indeed, although it was about noon when he took his stand there, it was not until past the hour of vespers when, having examined the book thoroughly and taken a general survey of its contents, he got up to leave it. He afterwards declared to several persons, who asked him how he could refrain from looking on at such a splendid festival as had taken place in his presence, that he had been wholly unaware of it—an answer which made his questioners wonder even more than they had done at first.